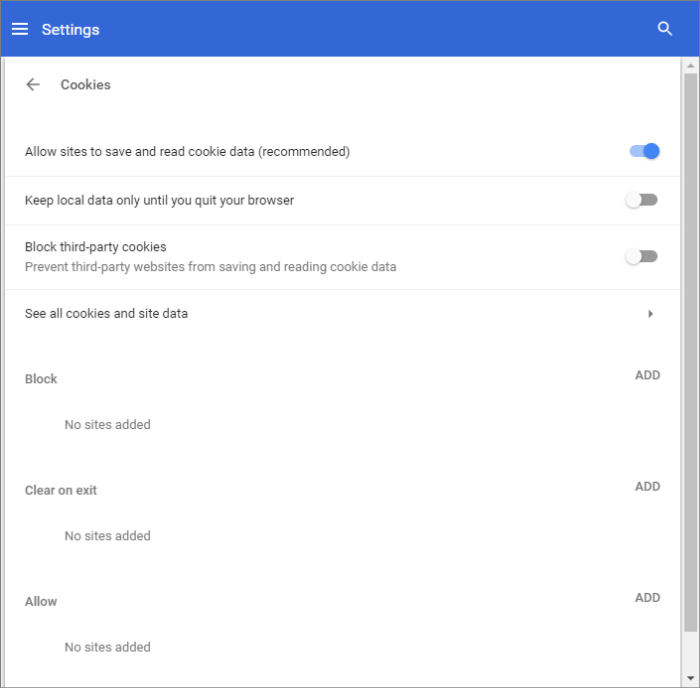 The 'Cookies' area lets you configure Dragon to selectively allow or block cookies You can also can view currently stored cookies and remove them. Configure whether or not to allow cookies to be stored. Allow sites to save and read cookie data (recommended) - Allows both cookies from the webpage you visit and from the third-parties like adverts displayed on the web-page, to be stored on your computer. Keep local data only until quit your browser - Allows sites to store cookies only until the current browsing session. The cookies will be automatically erased once the browser is closed. Block third-party cookies and site data - Allows only the cookies stored by the webpage you visit and blocks cookies from third parties like adverts displayed on the web page. To add an exception for a website, enter the domain name below the 'Add' field. All sub-domains too, will be automatically added. To block an exception for a website, enter the domain name below the 'Add' field. All sub-domains too, will be automatically added. Use the drop-down menu next to domain to choose whether or not to allow cookies. The options available are 'Allow', 'Edit', 'Block' and 'Clear on exit', 'Remove'. Add another site if required and repeat the cookie configuration process. A list of all cookies currently stored on your computer will be displayed. You can search for a specific cookie, start typing its name in the 'Search Cookies' text box and choose from the options shown below it. 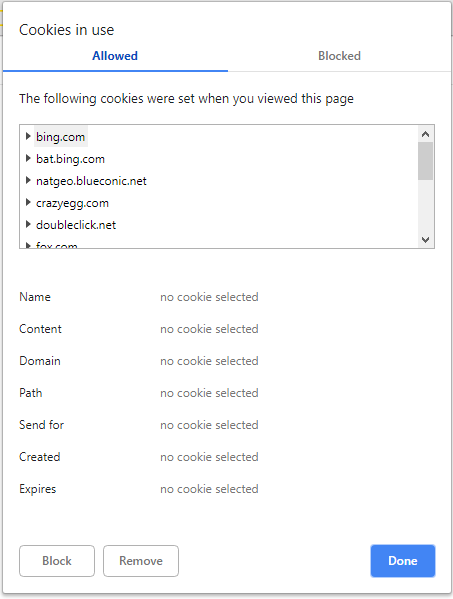 Cookie icon will be displayed in the address bar of the page that you have blocked or set to allow. 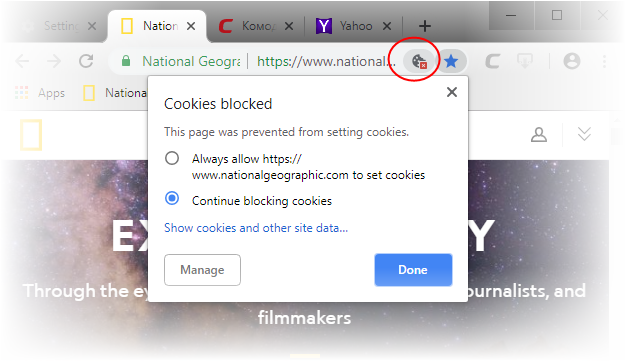 If you have selected to block all cookies by default, but made exception to allow cookies for a certain page, the icon will appear in the address bar of that page. If you have selected to allow cookies by default, but made exception to block cookies for a certain page, the icon will appear in the address bar of that page. You can view the cookies that have been blocked or set by clicking the icon. Click the cookie icon in the address bar. Click the 'Manage' button to configure exceptions. 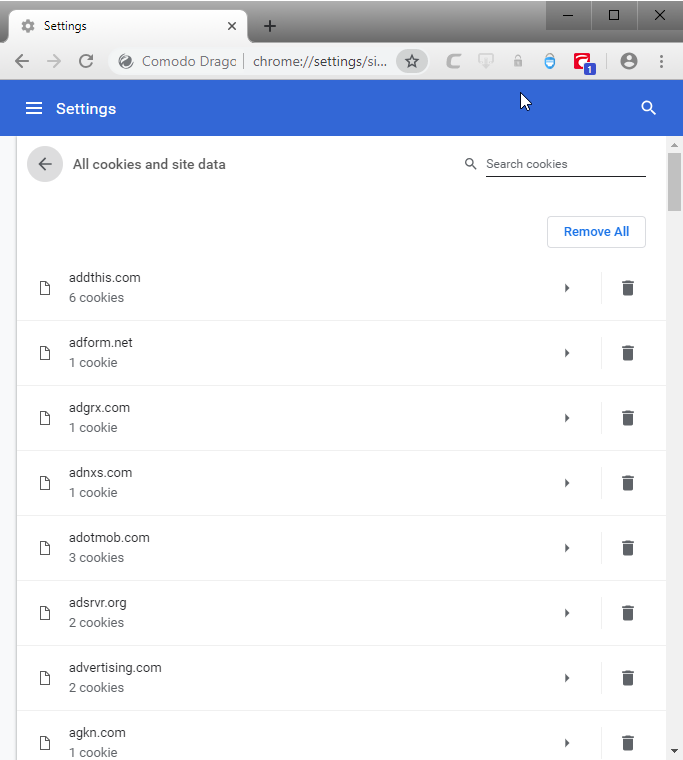 Click the 'Show cookies and other site data' to view cookies allowed/blocked from the website you are currently visiting. Click 'Close' for your changes to take effect.